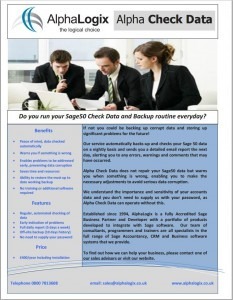 As a Sage 50 user do you run your Sage 50 Check Data and Backup routine every day? How do you know that the data you have been backing up is valid? If you don’t follow the Sage 50 Check Data procedure on a regular basis you could be backing up corrupt data. This can store up significant problems for the future. At AlphaLogix we see customers that regularly back up their data only to find that their data is corrupted when they finally come to rely on their backups! To get around the heartache of corrupted data backups the developers at AlphaLogix have developed a system that not only backs up your Sage 50 data but also validates it and automatically alerts you to any errors, warnings, and comments? This system has been given the snappy name of Alpha Check Data for Sage 50 and it does exactly what it says on the tin! The way that the system works is to back up your Sage 50 data off site, automatically validate your data, and then email the results. The results are a full status report, highlighting any: errors, warnings, and comments that might have occurred in your data. Furthermore, if you have Sage 50 support with AlphaLogix, we will work with you to help resolve any data corruption issues. Alpha Check Data for Sage 50 will not repair your data but gives you timely notification if something is wrong. This enables you to make the necessary adjustments before the disastrous effects of data corruption occur. Your data backups are stored for a period of 10 days to give a robust level of safety. Your Sage 50 accounts password is not required. At AlphaLogix we understand that your Sage 50 data is vital, sensitive, and valuable and as such you need not supply us with your password. What is the difference between Alpha Check Data for Sage 50 and the remote backup of all your data? The Alpha Check Data for Sage 50 service supplies you with a report alerting you to actual problems with your company’s critical Sage 50 data. If you haven’t been checking your Sage 50 data either remotely or in-house by using the Sage 50 Check Data procedure (previously known as Sage Disk Doctor): i.e. File, Maintenance, Check Data, on a regular basis, then you might have been backing up corrupt data. This can lead to significant problems for your business in the future. For more information please visit the product brochure.